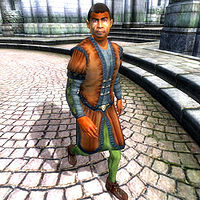 Curtis, a Redguard commoner, is an NPC who, while listed in the Construction Set, never appears in the actual game. He has some dialogue unique to him, but in his own words, he's "nobody special". One of his AI packages shows that he was intended to play a part in the undeveloped "Imperial Express" quest. He would have worn burgundy linens, a russet felt outfit and a pair of quilted shoes. He also carried his house key and a small amount of gold. Curtis would have had quite a busy schedule had he been present in the game. He would have slept from midnight to 6am at an unspecified "editor location". After waking up, he would've eaten a two-hour breakfast in the vicinity of the same location. On Loredas, he would have worshipped at the Temple of the One from 8am to midday; on weekdays he would have spent this time socialising in the Market District. On Sundas he would have wandered the Temple District from midday to 4pm. On weekdays he would have eaten a two-hour lunch at The Feed Bag. On Tirdas and Turdas he would have strolled around the Arboretum from 1pm to 5pm. On Morndas, Middas and Fredas he would've wandered the Temple District from 2pm to 8pm. In his spare time, he would have wandered near his editor location. Curtis would have had quite a few exceptions to his weekly routine. On the 12th of each month, Curtis would have left the city at 1pm to journey to the Newlands Lodge in Cheydinhal. Curtis would spend the following day at the lodge, visiting the Great Chapel of Arkay at 8am for four hours. As long as Gilgondorin has not died, Curtis would have gone to the Black Horse Courier at midday on the 30th of each month, and would've hung around for a brief amount of time before resuming his normal schedule. Like the other Imperial City residents, he would have been subject to martial law during the Light the Dragonfires quest, weathering the Daedric invasion at his editor location. When approached, Curtis was supposed to introduce himself with: "I'm Curtis. I'm nobody special." and elaborate when asked about the Imperial City: "The Nine say each of us is special, but that's just a lie. I don't mind, but it just sounds stupid." Esta página foi modificada pela última vez à(s) 21h33min de 24 de dezembro de 2013.